Counter-Strike: Global Offensive is one of the biggest games in the world, and it’s also one of the most demanding eSports titles around. To get the best out of Valve’s shooter you need a seriously good PC – as well as a rapid-fire trigger finger. Buying a desktop for CS: GO means looking at a set of specific requirements. It needs a high framerate to play at the top level, so you’ll need a top-quality graphics card – and the game’s solid CPU load means that graphics chips need to be paired with a decent processor. The fast pace of the competitive scene means that it’s best to have a motherboard with some solid networking features, too – good and bad hardware here could make or break a crucial match. Getting the perfect PC for CS: GO needn’t break the bank, though. We’ve trawled the internet to find the best systems for Valve’s shooter that are available on both sides of the Atlantic, and we’ve uncovered machines with different prices and form factors – perfect for any scenario. We’ve also highlighted some of the top peripherals for use with CS: GO, including monitors, keyboards and mice. 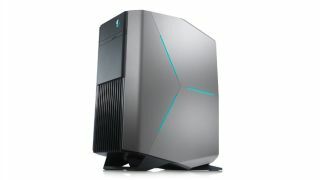 Alienware is a long-term big beast in the global gaming market – and the firm has churned out some seriously good machines in the last few years. Its systems aren’t ruinously expensive these days, and machines like the Aurora balance good components with eye-catching physical design. Under the hood, it’s got a Core i5-6400 processor, which has four cores and a 2.7GHz stock speed, and 8GB of dual-channel memory is plenty. There’s a 1GB hard disk, and Killer Ethernet on-board for world-class wired performance. The American configuration of the Aurora comes with an Nvidia GeForce GTX 1060 on-board, while British buyers are given the AMD Radeon RX 480. They’re both stellar chips that’ll play CS: GO at 1080p and beyond, and Dell offers a huge array of customisation if you fancy something else. American gamers can choose from a huge range of Nvidia chips, while the British system can be configured with GPUs from both AMD and Nvidia. The GPU isn’t the only component that can be customised. Beefier processors, faster storage and larger amounts of memory can all be included in this versatile rig. And, for online gaming, Killer Wireless can be fitted – a crucial upgrade for competitive players. An Xbox One wireless controller can be included with this rig alongside Dell’s own gaming monitors. The American and British versions of this machine start at $1,000 and £949 respectively, and both are great deals. It’s a top-notch rig if you’re after a big-brand machine for Counter-Strike – and the perfect partner for one of these top-notch gaming mice. The Asus Republic of Gamers G20CB is one of the most striking gaming PCs on the market. It’s covered with the Mayan-inspired patterns that Asus loves to lavish over its ROG-branded hardware, and its small frame is decorated with imposing lights and dramatic angles. The G20’s interior is packed in tightly, but that’s no surprise considering the wealth of hardware inside and this machine’s tiny 104mm width. There’s a GTX 1070, which is one of the world’s best graphics cards right now, and a Core i7 processor. The former part will easily run CS: GO at its top settings, and the latter is a muscular CPU that outpaces Core i5 silicon thanks to a higher speed and better multi-tasking capabilities. Elsewhere there’s 16GB of memory, a huge hard disk, and the lighting can be customised with the full RGB gamut – so there are 16.7 million colours to choose from. There’s SonicMaster audio for mind-blowing sound, an Asus-exclusive performance monitoring app, and Intel’s Gigabit Ethernet with gaming tweaks to improve network traffic. This is one of the smallest systems here, but it’s also one of the most potent – so CS: GO will run with ease alongside the rest of your games. This full-size gaming tower is a beast that’ll breeze through CS: GO – and it’s ideal if small-form-factor machines or big-brand desktops aren’t your thing. The powerful components inside this machine handle Counter-Strike with ease. The Core i7-6700K processor has four cores and a monster 4GHz speed, and here it’s chilled by future-proofed liquid cooling. There’s 16GB of memory, and an SSD for Windows alongside a hard disk for bulk storage. The Xtreme 2000 comes with gaming-grade motherboards with Ethernet designed for gaming, and this is a proper desktop PC – so the motherboard and the eye-catching case are loaded with upgrade paths if you want to expand in the future. This machine even comes with an Avermedia video capture card – perfect for streaming. American buyers get this PC with AMD’s Radeon RX 480, while Brits lock and load the GTX 1060. Both are fantastic cards with the grunt to handle CS: GO, and both can be customised with any current card you’d like. Both of those GPUs can handle 1080p and 1440p playback – so check here for our verdict on the market’s best monitors. That’s one of the key advantages to buying from CyberPower: every component is customisable, with dozens of options available for every part. The machine comes with a great warranty too – its default deal is a three-year service plan – and that can also be improved. CyberPower’s PC is bigger and more expensive than many of its rivals, but it’ll blitz CS: GO and will also handle most other titles. It also has more upgrade room than smaller systems, and its components can be overclocked. This machine is the most expensive in our round-up, but it’s a deeply impressive PC that’ll handle CS: GO, other games, streaming, work and play with equal aplomb. It’s immediately striking. The Y710 Cube is little bigger than a shoebox, and it’s decorated with smart, angular meshed sections. It looks the part, and it even has a handle – perfect for lugging to LAN parties or even just moving around the house. This smart, sturdy machine has a surprising amount of power on the inside. The $1,973 (about £2,215) model we’ve examined has an Nvidia GeForce GTX 1080 installed along its entire length: perfect for CS: GO, and also enough power to handle 4K gaming and VR headsets. It’s also got enough power to play games using top-notch Nvidia G-Sync screens at framerates beyond 100fps: the Asus ROG Swift PG248Q would be an excellent choice. The rest of the specification is similarly muscular. There’s a quad-core i7-6700K processor, lashings of memory, an SSD and a hard disk, and wired and wireless internet comes from gaming brand Killer – so CS: GO traffic will be prioritized and you’ll be able to play the game with more success. Lenovo’s machine has customizable lighting, pre-installed software for Xbox controllers, and it’s also available with a Core i5 processor and GTX 1070 graphics – perfect if you don’t need 4K playback or want to save some cash. This pocket-sized PC offers a deceptive amount of power in a sturdy, small chassis. If you want to play CS: GO and need a system where portability is key, look no further. The most dramatic-looking machine in our CS: GO system selection comes from MSI. The Aegis is a small-form-factor device that steals the show thanks to a dramatic design that sees the components angled in a chassis that’s pitched forwards and stood on a solid metal base. The incredible design contains components that offer impressive power. The Nvidia GeForce GTX 1070 scythes through Counter-Strike and can easily handle other games and VR headsets, and it’s bolstered by a Core i5 processor, 8GB of memory and a 1TB hard disk. The relatively modest price doesn’t mean this machine is lacking features. It’s got wireless internet, easily-accessible components and lashings of LED lights that can be customised in Windows 10. It has a handle for easy access, and it’s deceptively quiet even at full load. It’s certified by peripheral experts SteelSeries, too, so you can pair this rig with top-notch keyboards and mice. If you’d like to check out a top-notch gaming peripheral, here’s our verdict on the top ten gaming keyboards. This striking system has the power to play CS: GO alongside a wealth of exciting features. If you want your PC to make a statement, few are better than this.